I’m sure you’ve noticed by now that the NFL is now a passing league and out of all positions in the league this year wide receiver is by far the deepest position of them all and there’s a ton of value. As much as I would love to have a top tier receiver like Calvin Johnson, Demaryius Thomas or A.J. Green, you can wait a little while on receiver and still have great value so if you have a chance to grab one of the top 4 running backs or just want a stable quarterback like Peyton or Brees to lead your squad. These players aren’t sleepers. In fact most of them will be going in the early to mid rounds, but they’re all players that I feel have a lot of value coming in to the 2014 season. Without further ado, here are some of the wide receivers who I am looking to target on my fantasy team this season. For more on the wide receiver position be sure to check out our 2014 Wide Receiver Rankings post where we break down the top 50 pass catchers for the upcoming season. 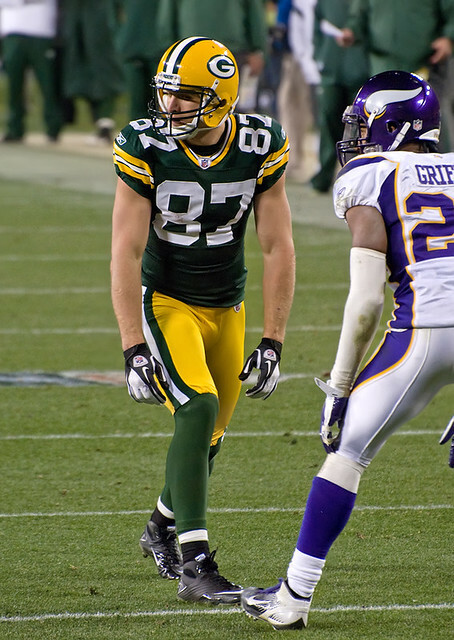 Jordy Nelson, Green Bay Packers – If there’s a receiver that I’m going to be disappointed if I don’t get, it’s Jordy Nelson. Last year when Aaron Rodgers was healthy, Jordy trailed only Calvin Johnson and Julio Jones in points per game and despite Rodgers missing seven games, he still posted career highs in receptions and receiving yards all while catching passes from stiffs like Matt Flynn and Scott Tolzien. In 2014 there are a lot of reasons to think Jordy will put up even bigger numbers. The obvious reason is that Rodgers is healthy, and that is a huge plus, but the Pack will also see the return of Randall Cobb, which will prevent defenses from taking Nelson out of the equation. Green Bay also added a trio of talented rookies in the draft, and if that allows the team to go three or four wide on every play, that’s just gravy. Nelson is also entering a contract year in 2014 and has made it known that he’s seeking $10 million per year at a minimum. Whether you believe in the contract year boost or not, you know he’ll be working harder than ever as he shows the Packers or the other 31 teams that he’s worth a big payday this off-season. Right now Nelson is being drafted 10th amongst receivers, and 26th overall, which makes him a late second, early third round pick. I would gladly take Nelson as my WR1 in any league, but if you can land him as your WR2 or pair him with a top running back, you’re team will be in great shape for 2014. Pierre Garcon, Washington Redskins – When the Redskins gave Garcon a 5 year $42 million deal many experts laughed and claimed Garcon was a “product of the Peyton Manning offense”. In 2013 Garcon had the last laugh catching 113 passes for 1,346 yards shattering his previous career highs all while playing in one of the league’s most dysfunctional offenses. What impressed me most about Garcon last season was that the bulk of his production came while catching passes from RGIII, who clearly wasn’t himself, and Garcon was clearly the focus of the Redskins offense and defenses were doing everything they can to stop him. In 2014 the Redskins offense has a whole new look with a new coach, a pass friendly scheme and Garcon now has former Eagles receiver DeSean Jackson and tight end Jordan Reed to keep defenses honest. Most importantly, as I stated in the quarterbacks to target article earlier in the week, I believe Griffin will be fully healthy this season and with his legs underneath him the sky is the limit for this offense. Right now Garcon is being drafted as the 12th wide receiver off the board in the late third, early fourth round when others are drafting riskier players like Cordarrelle Patterson, Zac Stacy and CJ Spiller. If you’re in a PPR league Garcon is fantasy gold and a solid low end WR1 who you might be able to grab as the second or third receiver on your team. Michael Floyd, Arizona Cardinals – Floyd was a polished receiver right out of Notre Dame, and has all the physical tools to be a star at 6’2” 220lbs with good speed and hands. He put it all together last season to the tune of 1,054 yards and 5 touchdowns on 66 grabs. As impressive as Floyd was in 2013, scouts and reporters have been raving about how he looks in off-season workouts with beat reporter Kent Somers reporting that Floyd appears to have a better grasp of the offense and that he “caught nearly everything thrown his way”. Head coach Bruce Arians loves to put the ball in the air and with Larry Fitzgerald on the other side defenses won’t be able to key on Floyd. Although Carson Palmer’s better days are behind him, he’s a proven veteran quarterback who knows how to distribute the ball and is more than capable of giving both Fitz and Floyd quality numbers. Right now Floyd is the 17th wide receiver off the board with a late 4th round price tag and at that price he’ll be finding his way on to a lot of my teams. I’m looking for an Alshon Jeffery type breakout for Floyd this season and it wouldn’t shock me at all to see him join the NFL’s elite pass catchers. Terrance Williams, Dallas Cowboys – There are a few second year receivers who look ready to breakout, but the one that stands out the most to me is Cowboys receiver Terrance Williams. Williams has all the measurable at 6’2”, 208 lbs, with good speed and an ability to make catches in the red zone. In 2013 he posted respectable numbers as a rookie, catching 44 passes for 736 yards and 5 touchdowns, starting 8 games along the way. Williams was was inconsistent from week to week, as most receivers are their first year, but a lot of that can be attributed to the presence of Miles Austin in the Cowboys lineup and when Austin was hurt Williams targets and production increased dramatically. In the off-season the Cowboys released Austin (now in Cleveland) and named Williams the starter. Without any other major playing time threats on the depth chart, Austin should get plenty of looks from Tony Romo. This year’s version of the Cowboys should feature an even more explosive passing game with Scott Linehan calling the plays. With defenses double covering Dez Bryant and rolling coverage to Jason Witten underneath, Williams is going to see a lot of single coverage and should give the Cowboys the vertical threat they need to open things up even more. Right now Williams is being drafted as the 35th wide receiver off the board (just behind fellow breakout candidate DeAndre Hopkins) with an ADP of the late 7th round. Williams has massive upside and he plays in one of the league’s better offenses. He should be a big time bargain this year. Brandin Cooks, New Orleans Saints – I don’t normally get very excited about rookie receivers because for every Keenan Allen there’s a dozen other receivers who won’t sniff 500 yards, but if you’re in a PPR league Brandin Cooks needs to be on your radar. Cooks is a little guy at just 5’10” 180lbs (that might be generous) but he’s a waterbug who can fly around the field with his 4.3 speed. He’s not going to win a lot of jump balls in the end zone but he’s going to be very difficult for defenders to match up with in open space and Sean Payton will make sure he gets the right matchups. Before the draft Cooks was high on my draft list but when the Saints drafted him, I knew that he was going to be on all my teams. I don’t like going all in on rookie receivers, but I believe in Cooks’ talent and this situation is beautiful. In New Orleans, Cooks should fill the roles of both Darren Sproles and Lance Moore and will be lined up everywhere. This team passes the ball a ton, and isn’t shy about piling on even when they’re up big. With his speed and Drew Brees pulling the trigger there is upside for Cooks to haul in a ton of receptions even in his first season. Cooks is being drafted 39th among receivers in the 8th round. I wouldn’t reach for him in a non-PPR league but in a PPR I’m looking to grab him while your league mates are chasing Sammy Watkins instead. As an added bonus, I’ve seen Cooks ranked extremely low in the pre-draft rankings on some fantasy league sites so if your friends forget about him, stash him away in your draft queue and steal him late.